The Philadelphia Eagles have historically had good success with swing screens. In the 2015 season, the Eagles ran variations on this concept 21 times for 162 yards, averaging 7.7 yards per play. Let&apos;s take a look at a few of the their swing screen concepts. The read-key linebacker (No. 51) takes a zone-drop here so the QB throws the swing screen. The linebacker’s zone drop allows the offense to out-leverage the defense to the perimeter. By the time the inside linebacker can meet the running back on the edge, he has already gained six yards. This time, the inside linebacker runs with the running back on his swing route, so the QB looks backside to the slant/flat concept. The strong safety brings pressure off the edge to the boundary which then places the inside linebacker in conflict. As the QB brings his eyes backside, he can see the inside linebacker starting to move with the arrow route, so the QB waits momentarily for him to clear before throwing the slant route. The swing-side inside linebacker runs with the back again, so the QB works backside. This time, the defense is playing cover 1 with a low-hole “rat” player, so the QB must throw the slant quicker in order to beat the rat player. The QB will read away from the MIKE linebacker here. If he stays in the middle of the field, then the quarterback will throw the swing. If he runs with the swing route, then the quarterback will work the backside double slants concept. The MIKE takes a zone-drop here, so the offense has the defense outflanked on the perimeter. Versus two-high alignments, the safety will be unblocked in the alley, but the running back should be able to pick up a decent amount of yardage before the unblocked defender can get there. Although this next example involves a different frontside concept, this shows the QB throwing the double slants concept after reading away from the MIKE. This time, Oregon is using a snag concept to the boundary but the QB is still reading away from the MIKE. The backside of this play would look the same if the MIKE was to run with the running back on a swing screen. 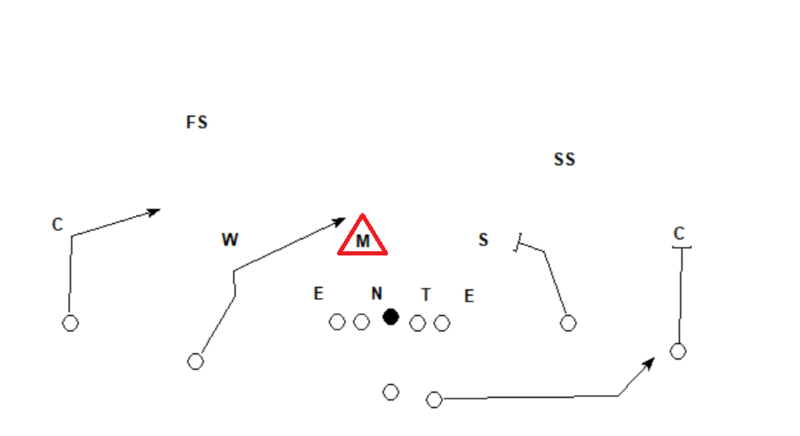 With the MIKE rotating strong, the middle of the field is opened for the inside slant. The slot receiver will stem inside at the weakside linebacker and then attempt to cross his face into this open space. This time, the WILL has inside leverage by alignment on the inside slant. The slot receiver will still stem inside at him to try to gain leverage, but this is not always doable when running a three step route. The WILL taking away the inside slant does open up space to throw the outside slant behind it. The QB should be able to see this quickly after reading the MIKE linebacker and be able to throw one of two slant routes on one-step. 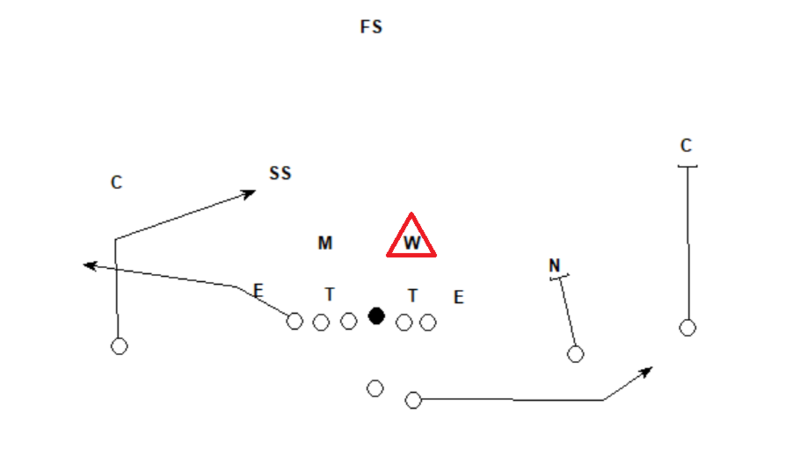 This is another simple concept that can be used to enhance the running back swing screen. This is a good option for teams who do not want to involve their quarterbacks in the running game.